2018 is nearly over, but there is still controversy to be found. Social media users have targeted Forever 21 for using a white model in their Wakanda Forever sweater promotional photos. The Black Panther inspired sweater images have been taken down and replaced with a picture of the sweater by itself. The Marvel movie is one of the biggest of the year, crushing the North American box office as the highest-grossing movie of the year while coming in at number two globally, which means that merchandise is also flying off of the shelves. Earlier this week, Forever 21 posted a picture of the Wakanda Forever sweater with a white model wearing it in different poses. The model looks a bit like rapper Eminem, with the same style haircut, and some social media users are pretty angry over the situation. One woman replied to the advertisement by saying, "Y'all really put a colonizer in a Wakanda shirt." Others claimed that the company made the ad on purpose to drum up publicity for the Black Panther sweater. As with any controversy, there are people on the other side who don't believe that Forever 21's choice to use a white model for a Black Panther sweater is that big of a deal. Many pointed out that Wakanda was created and brought to life by two white men, while others believe that Wakanda is for everybody, not just a black audience. 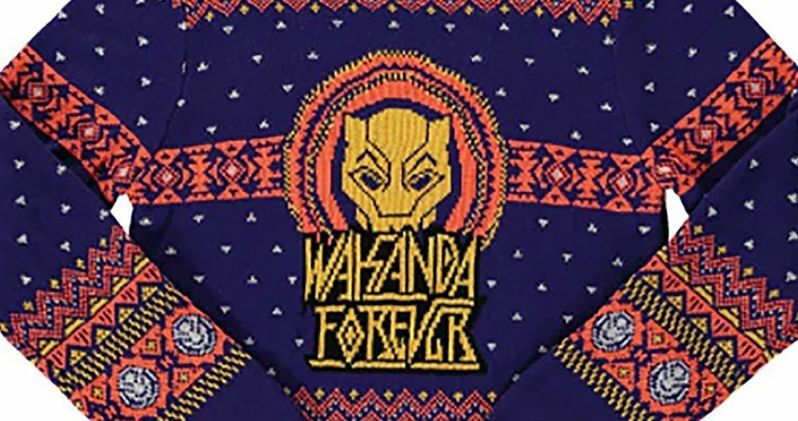 There are arguments being made for both sides of the controversy, which is really helping to promote the Wakanda Forever sweater, but it's unclear if more people are actually buying the sweater online or in stores. Forever 21 released a statement, which you can read below. "Forever 21 takes feedback on our products and marketing extremely seriously. We celebrate all superheroes with many different models of various ethnicities and apologize if the photo in question was offensive in any way." Forever 21 came under fire for the same thing back in 2013 when they used white models for their N.W.A. line of clothing as well and took the pictures down as a result. However, nothing is really ever erased from the internet, so those pictures are still floating around. People had the same reaction to the N.W.A. clothing as they are having with the Wakanda Forever sweater, with some vehemently opposed to it, and others who don't seem to care all that much. Forever 21 also found itself surrounded in controversy after marketing a collection of kids clothing that said, "Chicks Are All Over Me" and "Sorry Ladies I Only Date Models." The clothing company not only pulled the ad from the internet, but also pulled the shirts from production as well. Whatever the case may be, there's certainly more than a few people who took offense to Forever 21 using a white model to promote the Black Panther sweater. You can head over to Forever 21 to buy the sweater for $34.90, but the offending image has been removed. This guy looks like Joey McIntyre dressed up as peak "Real Slim Shady" era Eminem and they put him in a Wakanda Forever sweater. Soooo if i wore a gotham city shirt woukd that be insulting?you do know without a white man wakanda doesnt exist?you do know without people of all races its not the biggest movie of the year? I’m still wearing #Forever21 . Ya pressed over not a got damn thing. Has everyone forgotten #Wakanda and it’s people are fictional created by a white mans vision ? Goooodbye.